When it comes to farming, it turns out that small isn’t only beautiful – small is also sustainable, manageable, and productive. Come along on a tour of 15 successful farms, from urban rooftops to rural retreats, all flourishing on five acres of land or less. Learn from veteran farmers like Eliot Coleman and a new generation of growers like Jean-Martin Fortier how small-scale farms can be profitable, fulfilling, and vital to their communities; then set your dreams on the right track with tips and resources for planning your own compact farm. Head over to the links below to order the book or to find the publisher’s web site. There were a lot of people involved in putting this book together but I especially want to thank all of the farmers who were so generous with their time and with sharing information and photos. This is Josh Volk’s first book and it builds on writing about farming that he’s done on his own website, for Growing for Market, and for other farming publications. A trove of inspiration and practical advise for the next wave of young farmers; even experienced farmers will glean new wisdom. A must-read for anyone serious about making it work on a small plot of land. Wow! what an awesome, awesome book this is. 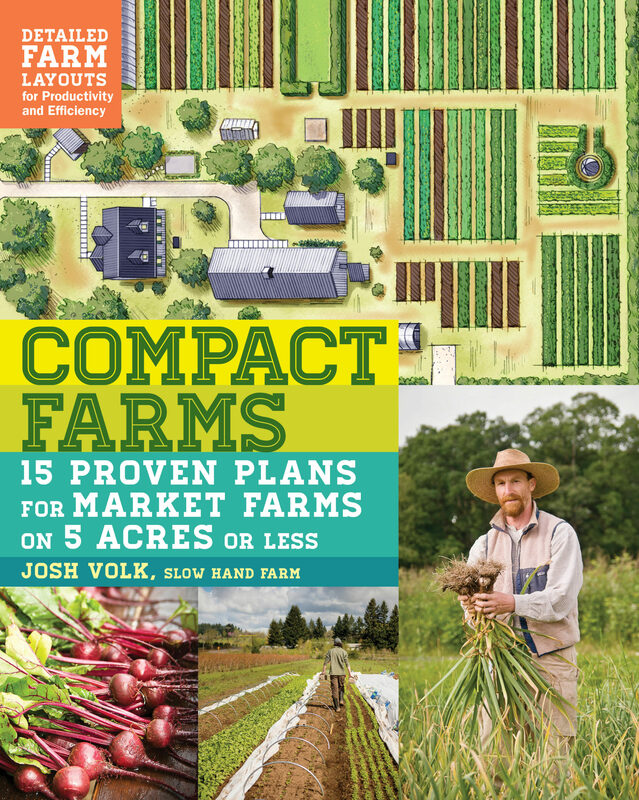 Compact Farms is a small-scale farming book like no other. Most how-to farming books will discuss the biology, management and/or tool part of growing veggies, but fail to acknowledge the importance of the farm’s overall set-up. This is where the book breaks new ground. By exposing the farm layout of different (successful) operations and describing how these influences productivity and efficiency, Volk is providing our small-scale farming community with great new insights about scale, design and patterning. He’s also proving, one more time, that a farm doesn’t need to be big to be profitable. As we try to change the food system, more people need to understand that scaling-up operations is not the only game out there. The stories and farm features in this book explain how small can be profitable…when well done. Not overly complicated, fun to read and beautifully illustrated, Compact Farms is a gem. I recommend more than reading it, I would invite growers (especially young ones) to study it well. Figure out the common « patterns » from each of these successful farms and emulate these, it’ll surely bring you where you wanna go, but faster. To buy signed copies of the book click the button at the bottom of the page. For inquiries directed to the publisher please visit their website here. For inquiries directed to the author, please contact him through slowhandfarm.com, or by using the mail icon below.